The Atlanta Poker Club is a free roll, no risk, no buy-in poker league that organizes daily Texas Holdem Games at pubs, sports bars and restaurants across Georgia. We have events seven days a week with multiple places to play every day. The APC was one of the first poker leagues in Georgia, arguably the best, and certainly the most competitive and prestigious. Our first tournament happened on April 20, 2004 and we have been consistently running events ever since. 100% No Gambling! No gambling of any kind is allowed at any Atlanta Poker Club event. You are competing with free chips that have no value or cost. 100% no risk to you. You will not risk or lose money. You can win some (and a bunch of other league prizes, too). No league dues or fee’s. It is free to join the Atlanta Poker Club. All skill levels welcome. New players learning the game up to skilled amateurs and semi-professionals honing their skills for casino real money events and everyone in between is welcome. Win prizes every night and big prizes each and every month. Win cash to gear to seats in casino tournaments like the World Series of Poker and WPT events. New players may join during any part of the season and are always welcomed. Come out and get lucky! Have some fun playing free no limit Texas Holdem tournaments at sports bars, restaurants and pubs across town by joining the most rewarding poker league in Georgia! Sign Up to become an APC Member – Fill out the short form to get registered as an APC member today. Where to Play Poker with the Atlanta Poker Club – View the list of all APC venues. We play in restaurants, sportsbars and pubs across town, every day of the week with multiple choices of places to play. See this weeks schedule which is always current and up to date. New players are always welcome and events are free to play. You get 1500 chips to play in our events just for showing up. These are free. There are not any chips ever for sale in an APC event. You can earn free bonus chips, explained below. While our evens are 100% free to play, there is a common courtesy and expectation that you will spend money on food and or drink at the host venue. They pay us a fee for organizing and executing the event and they make their money back through your food and drink purchase. That’s how it works and that’s the deal. So, if you spend money you can earn free bonus chips to add to your stack up through the cutoff time. If you spend $25 you have ‘maxed out’. That amount gets your the maximum number of chips you can receive through food or drink purchase. You can not buy your way to the final table of an APC event. You can also earn free bonus chips by learning how to deal and being a full time dealer for your table. Our poker events are designed to provide provide the most entertaining tournament experience possible tied into a rewarding league structure full of regularly scheduled competitions and special events. We organize fun, fair and competitive poker tournaments and provide a league competitions with leaderboards and special events. In our events you’ll see that players start out with a generous starting stack and a blind schedule that gives you plenty of time to play poker just like you are at a real casino. Players win thousands of dollars of prizes every month! Players compete for monthly prizes – Cash prizes each and every month in a tournament that you qualify for the previous month, Plus a $100 points race that resets each and every month! Players compete for Championship Coins – Seasonally we give away championship coins (custom engraved silver card guards with your name on it) across the league and have the league wide seasonal championship. Players compete compete for the ultimate prize during the APC year – a VIP Las Vegas Experience including a seat in the Main Event! With the APC, you get the best of both worlds. You get an entertaining night out combined with a challenging and rewarding poker league running in the background. So not only will you win a prize for winning a tournament but you will also win points on the APC leaderboard and your own custom poker player profile page! You will compete with other players to see who can win the most points on a particular night at a particular location over a season. Actually, there are a lot more challenges and competitions running within the Atlanta Poker Club league, so you can read more about how the league works on our Atlanta Poker Club League Structure page. New players are ALWAYS invited to join our poker league, regardless of your skill level. From total beginner to advanced poker player (and everywhere in between) everyone is invited to join the club and play poker in our poker league. It is always 100% FREE to join the Atlanta Poker Club as a player and be eligible to compete for our incredible league prizes as well as become a part of our community. The Atlanta Poker Club is a value added entertainment provider serving the hospitality industry since April of 2004. Hire us and increase your bottom line. Affordable Rates – We understand that you have to make money for us to make money. Easy to work with – No long term contracts and no start up fee’s. Been in business hosting events since 2004. Thousands of Atlanta area players make up our player base. Professional marketing, print and online. Repeat, Steady Business – We deliver players who come back week after week and support the host venues that offer APC poker. We do not compete with you on the same night time! – We will not schedule competing events directly in competition with your established APC poker night. Ready to get started or learn more? Hire the Atlanta Poker Club or call our office at 678-650-8125. 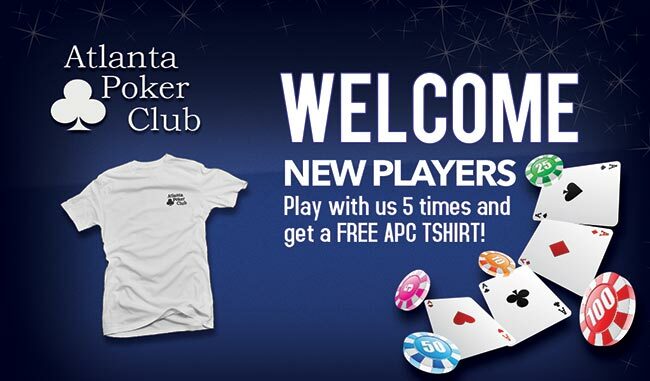 Welcome to the Atlanta Poker Club! Thank you for joining for the Atlanta Poker Club! Please check your email for a message from us. You must confirm your membership by clicking on the link in that email and filling out the short form. This is also how register for your bonus chip coupon and new player free t-shirt card! If you have signed up with us previously you will not get another confirmation email. To get the free t-shirt card you must click the link in the email to confirm and fill out the very short new player agreement form! Welcome aboard! You are now welcome to come out and play poker with the APC today. Just find a venue you want to play at and let the Tournament Director on site know that you have just registered online. Remember, it’s 100% free to play. The Atlanta Poker Club league page has a great list of topics covered in depth including the prizes you can compete for and how the competitions and qualifications work. These pages are great for getting you up to speed on the league-wide challenges, special events and details on how to compete. To keep up with the current and most recent promotions check our blog and Facebook page. We list special promo’s, free-rolls and more time sensitive information here. If you are more interested in the daily happenings our Facebook group is where members chat, photo’s are shared and winners are featured. You can also ask open questions to the group and get answers around the clock. Promo’s and contests are listed here as well so it is a good idea to join our Facebook group. It is pretty easy to play poker with us anytime. Be respectful of others – we expect them to do the same towards you. Support the host venue through food and drink purchases. They pay the APC to organize the events so there is no cost to you to play. In turn, we ask you support the host venue when you come to play. This is how it works. Enjoy yourself and make friends! You can learn how to play Texas Hold’em here. 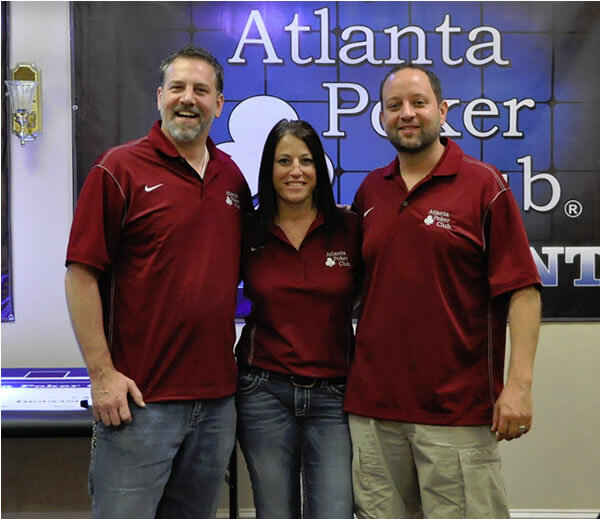 From the APC Management, Erin, Fuller and Spry, we welcome you to the Atlanta Poker Club and we vow to work hard every day to make sure the Atlanta Poker Club is your poker league of choice. Thank you for joining and good luck at the tables!